Interead today announced its new models that will be introduced at CES 2010 this week. The new pack of brightly colored ereaders is also multicultural—the company says these new COOL-ER readers work in every country on the planet. 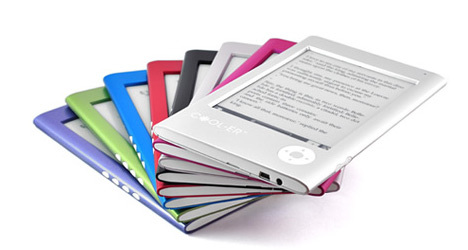 The COOL-ER ereaders support ebooks in every language and have menus in English, Spanish, Portuguese, German, French, Russian, Japanese and Chinese, and also support multiple zoom levels to create a customized and comfortable reading experience. 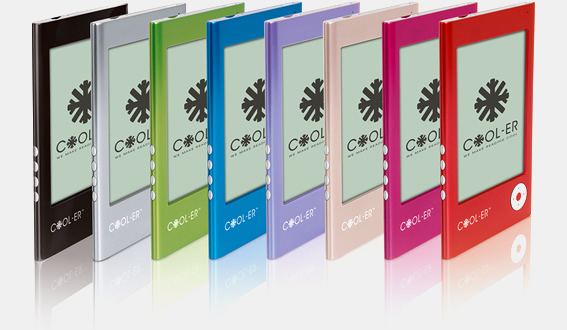 The new COOL-ER Classic is the lightest and, according to Interead, “most elegant” ereader model being announced. This model is currently available in a variety of places and colors. The Classic features a Samsung S3C2440 ARM 400MHz processor, 1GB of storage and a Linux operating system. The petite and portable COOL-ER Compact measures in at only 6.7″ x 4.6″ x 0.41″ (170 mm x 117 mm x 10 mm) and Interead claims it has the “smallest footprint of any ereader while still maximizing the reader experience” with a 6″ E Ink screen. The Compact sports a 2GB onboard memory (expandable via SD card to 6GB total) and will be available this Spring. Another new model, weighing in at only 5.8 ounces (164 grams), the COOL-ER Connect has built-in WiFi-enabled connectivity. The Connect also sports an “easy-to-use” touch screen—which is nice because most people are turned off by hard-to-use touchscreens. This model will also be available this Spring. Last but not least, the new COOL-ER 3G model adds 3G connectivity to the ereader experience, keeping you connected on the go and where ever you are. This 3G connected ereader will be available in mid-2010. More images and prices are to come once the final announcement is made at CES.